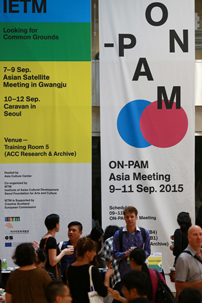 In his keynote speech opening the IETM Asian Satellite Meeting in Gwangju(7-9 Sep. 2015), dance critic Namsoo Kim mentioned the travels of a thirteenth-century Flemish monk, Friar William of Rubruck, to the Mongolian courts of the Great Khans. In his account of this journey, William talked about the conversations that took place in a big tent, set up for representatives of different religions to meet face to face. There, they had day-long discussions about their beliefs and differences, but always with mutual respect and at the end of the talks everyone raised a glass. It is a remarkable story that certainly inspired a group of 120 performing artists, programmers, organizers, networkers and researchers, some of whom travelled a long way to Gwangju to get to know each other, to talk about future collaborations and look for common ground. The occasion for this meeting was rather fitting, since the opening of the Asian Arts Theatre(AAT) in Gwangju might well redefine global relationships within the performing arts. It certainly opened with a bang: an ambitious inaugural festival, showing no less than 33 performing arts productions a wide and diverse range of work from Asia and abroad, both productions and coproductions of Asian Arts Theatre itself and invited international work to a mixed crowd of local and international audiences, and this is only the beginning. The first season (2015-2016) of the AAT will present some of the most renowned international artists and their seminal productions (directors Robert Wilson, Christoph Marthaler, William Kentridge, etc. ), next to newly commissioned work from Asian artists and community-based projects with local artists from the Gwangju region. The AAT team is clear about their goals with all this: They want their space to become a hub in the fast-evolving performing arts scene, not only in Korea but for all Asia. And looking beyond simply supporting creation and presentation, the group is also interested in stimulating intra-Asian networking and the international distribution of performances. It is in this way that the AAT hopes to provide a backbone for an interesting grassroots dynamic in Asia’s performing arts scene. 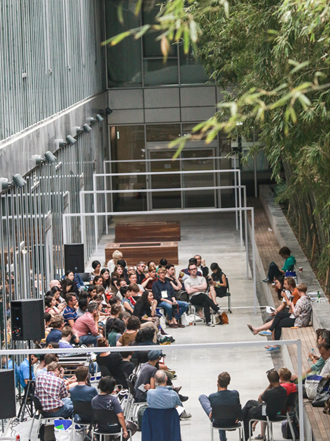 During the last decade, new networks of artists, producers, and venues have been developing. Up until now, Asian artists and producers in need of places to network and discuss projects mostly met outside of Asia, typically at European festivals. To find the resources to produce their work, they had to rely on the choices and tastes of mainly Western festival directors and programmers. 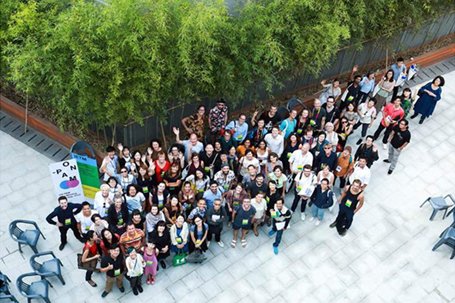 As a result, the AAT has the potential to become a powerful tool for Asian artists, working alongside other existing and developing networks such as Arts Network Asia(ANA), Japan’s Open Network for Performing Arts Management(ONPAM), and more recent initiatives such as the Asian Producers Platform. At present, it appears likely that global geopolitical balances in the performing arts production sector might shift. For the last few decades, the center of global production capacity in the performing arts has been in Europe, where a number of producing and presenting organizations with the confident support of government shave been able to create and develop networks for transnational production/coproduction and presentation. But the pressure on this system is growing after funding cuts by different national, regional, and local governments in the wake of the financial-economic crisis. From the neoliberal perspective, governments should step back and performing arts should be pushed more toward the market. In Asia, the exact reverse is happening. Investment in the Asian Arts Theatre is symptomatic of an increased government interest in cultural policies. This contemporary art project is part of a wider scheme to investigate and construct a new cultural identity for the whole continent, including the development of new tools for international cultural policies that will promote this identity worldwide. It is telling, then, that the Asian Arts Theatre is part of the expansive Asian Culture Complex, making Gwangju a self-declared hub city of Asian Culture with six different agencies managing research regarding the promotion of Asian culture (e.g., the Agency of Culture for Children, the Cultural Promotion Agency, and a significant archive and research centre about Asian Culture). Put simply, this is not an isolated phenomenon. In other countries and cities as well, comparable complexes are being developed (for instance, one in the Hong Kong’s West Kowloon Cultural District, opening in 2018). Here and elsewhere, gifted and dynamic arts entrepreneurs seek to connect these top-down initiatives to bottom-up dynamics.Where will all this go next? 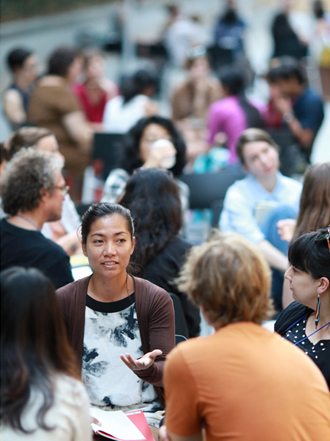 What will be the impact of this project on cultural dynamics in Asia, and even globally? Are all these developments a growing level of Asian confidence, the rise of grassroots networks, a growing accommodation for culture in international policies, the development of hubs making the connection between these grassroots and top down dynamics a viable sign of a shift in the global balance of power? Are we really at a turning point, or will these trends prove to be short-lived? For instance, it still remains to be seen how sustainable the Gwangju culture complex eventually will be. While the building is an architectural wonder and the theater has great ambitions, in the local context it seems to be an alien body. Moreover, the government appears to be stepping back: The establishment of support for local audiences and local stakeholders symbolizes a long-term effort, but the working budgets for the AAT have already been cut. The future will show how current developments will impact the work of Asian artists. At the same time, however, the future is now. Questions such as What is Asian art?, What is contemporary art?, and What does it mean to embrace these questions? (with the latter two found on the poster issued for the AAT opening) are at the heart of the AAT project. For reflecting on one’s own cultural identity, it is always interesting to enter in a dialogue with others which is where the IETM comes in. Since the 1980s, the IETM has been an important network for the contemporary performing arts scene in Europe: as a place to find partners but also as a platform for knowledge exchange and reflection about broader developments in both the performing arts and society as a whole. Over the last decade, the IETM has shown a growing interest in developments in Asia. 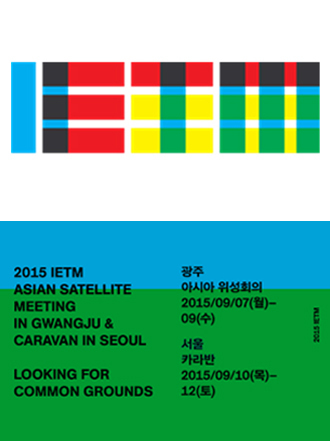 Since the 2006 meeting in Beijing, the IETM has organized seven satellite meetings in Asia, gatherings that have brought about important changes. Where the first meetings were held in places that represented the meeting of two very different worlds, the Gwangju meeting was less about we versus them, or the notion of uniting two worlds that were otherwise far apart from each other. Building further on earlier encounters, the Gwangju meeting instead focused on looking for common ground because, although the historical background and current contexts of Europe and Asia remain quite different, their common projects and interests have already been defined. In our current phase, knowledge exchange is crucial. When developing new networks, emerging Asian artists and producers are aware that there is much to learn from European experiences. Europeans, on the other hand, are very much inspired by the drive and sense of entrepreneurship of Asian artists and producers, many of whom work in a context where government intervention has always been limited. This mutual learning and inspiration has a common goal: to jointly develop new collaborative models for the performing arts of the future. The meeting itself was broken down into several relevant subtopics related to this: the rising phenomenon of creative producers, the benefits and disadvantages of long-distance collaboration, the impact of the digital shift in the performing arts, and, finally, the question of (Asian) cultural identity in relation to contemporary life a question that lies that is at the heart of the Asian Arts Theatre’s project. A first session addressed the role of creative producers and the question of what a creative producer, is exactly. Definitions seem to very not only among continents but also within them, as well as within countries and regions. The reasons for this are twofold. First, institutional contexts differ greatly in relation to cultural policies and concrete resources for developing, producing, and presenting work. Secondly, creative producers are known to adapt to the particular needs and ambitions of artists and companies, whose backgrounds and interests of course differ greatly. As a result, the working models of creative producers from all over the world are very diverse. At times they may focus on financial and management issues, while they may also direct themselves toward logistical tasks. In some cases, they are also artistically implicated in the project. Occasionally, their work is also to create contexts for presentation, for residencies, for networking, and for knowledge exchange and critical reflection. When exploring the necessary qualities of a creative producer, however, there are common elements beyond this diversity; the arts are always artist-driven. In any case, a producer will be the one who helps artists to make it all happen by assuring well-positioned members of the community of the legitimacy of an artistic venture and by assembling the necessary resources to realise a project. Therefore, a first requirement for any creative producer is to understand the artist, to track what they are doing, and to comprehend the meaning and essence of the artist’s work. This is a role that demands trust, respect, and mutual understanding. At the same time, a good producer must also serve as a counterforce. 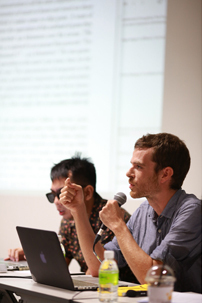 A project can benefit greatly from a critical dialogue between artists and their producers, where the latter can help the artists become more aware of the context in which their work will be seen and/or perform, such as where a piece can be staged or what it can potentially mean for local audiences. As stated by moderator and producer Erik Kuong Wa Fun during the conclusion of the session, Sometimes we need to tell our artists the truth. Long distance cooperation was the topic of a second working session. Faced with not only physical distance but also distances created by differences in cultural backgrounds and funding mechanisms, how can collaboration truly be a partnership on equal terms? How can local audiences be sufficiently briefed before viewing artistic work from very different cultural contexts? What other more practical obstacles will you encounter? And, in the light of all these difficulties, why would we want to work on a long distance collaboration in the first place? We are certainly not in it for any financial remuneration, as this kind of international work is typically quite expensive. Nor do we do it for ecological reasons, though there is a growing number of artists and curators who are thinking up new and more sustainable formats for international mobility. Among the diverse reasons for pursuing long-distance projects there is one common thread: the need for artistic exchange. This can be very personal, such as instances when an artist or a company is researching an idea and wants to test it in another context. Or when a programmer or a curator has seen the work of artists or companies in an international scene and wants to present it to his or her local community. More often, however, the personal becomes political. The choice of working with people from or within certain regions or areas might be inspired by historical or societal motivations for instance colonial history or the migrational background of some communities. Today, this might be more urgent than ever. In fact, what director Peter Sellars said in 1994 at Brussels’ Kunstenfestivaldesarts event rings more true than ever: The characteristic quality of our time is: it is the age of the refugee. According to Sellars, throughout our long human history of migratory flow, all global problems and issues have eventually become local issues, something that is especially true today. How will we, as artists and organizers, address this issue? If you believe in the power of the artist’s voice, it becomes very relevant to infuse local communities with the highly individualized views of artists from all over the world on current issues. After that, it is the responsibility of presenters to become the hyphen, linking these artists with local audiences to develop formats for presentation and communication that are clear about the societal urgency of programming international artistic work and also intent on protecting the artists from having their voices instrumentalized, or reduced to its origins or cultural context. This is because, very much in conjunction to what was said in the first session, participants agreed that artistic drive and personal connections should remain the starting point for establishing long distance collaboration. As moderator Stephen Armstrong stated in his conclusion at the Melbourne Festival, No more f***ing arranged marriages! A third session addressed the impact of the digital shift in society on the performing arts. More specifically, in what way do new digital tools impact the way we work, create, share, and experience the performing arts? During this session, a number of concrete practices, perspectives, and opportunities were discussed. First, digital tools changed the ways we reach out to and communicate with audiences. For example, there are a growing number of successful experiments involving the live streaming of performances, allowing companies and venues to reach out to new audiences both locally and internationally. In addition, digital tools are increasingly used to deepen and enrich the relationship between performers and audiences, for instance by providing additional information and context during streaming, stimulating interactivity, and the streaming of rehearsals to prepare audiences for a show. Second, the digital shift opens up new horizons for artistic creation and production. There are times at which digital technology serves a purely instrumental function, often acting a way of cutting costs. It is also becoming common, however, for digital techniques to be at the core of artistic projects, seen when robots become performers, actors interact with holograms, and new formats for interaction with the audience are being researched. At this point, we are not only talking about the impact of digital tools on the arts but also the reverse: situations in which the arts become a critical driving force in the digital shift. Increasingly, the performing arts reflect on and raise critical questions about our place as humans in social networks and virtual realities. At the same time, through collaborations with engineers, scientists, and businesses, artists are pushing technological innovation forward with their creativity. We see this happen more and more with the younger generation of artists, a group of digital natives who freely use and combine old crafts (such as theater and dance) with new, digital possibilities in artistic practices that can no longer be explained in terms of traditional artistic disciplines. In its most simple sense, their work might be labeled as transdisciplinary practices. Finally, the concluding session explored the questions at the core of the inaugural festival of Asian Arts Theatre: What is Asian art? What is contemporary? There is clearly a shift, said moderator Kee Hong Low (West Kowloon Cultural District, Hong Kong) in his introduction to the session. [There is] an increased desire for multiple Asias to gaze at Asia. Our gaze used to be defined by looking at Europe. But over the last ten years this gaze has shifted toward Asia because of cultural, political, and economic reasons. 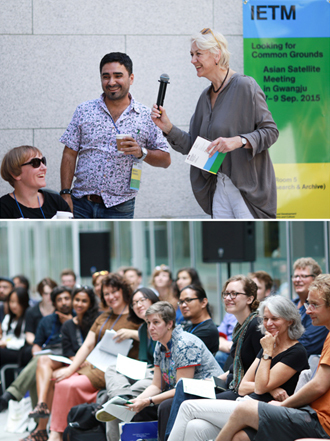 The idea of the session was to address how this shift has intensified interest in research and writing about Asia’s impact on transnational collaboration in the performing arts. The aim was less to reflect theoretically on these questions than it was to push forward with practical answers. What are the areas of interest shared by the participants at the meeting, whether they are from Europe, Australia, or Asia? What practical conditions can everyone put on the table to make joint collaborations about these issues possible? 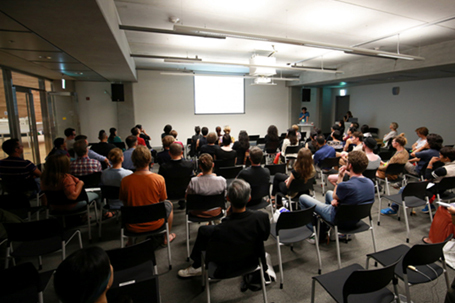 The topics that emerged where manifold, including brainstorming about the development of concrete new channels and instruments for networking and collaboration, suited to the ever changing needs of artists and companies. There were also discussions about different research topics, such as the role of art and culture in cities and the issue of global migration flows, religion, and identity. All this is mammoth, Kee Hong Low stated in conclusion, but it is not impossible: There are already connections in the making and things happening. Indeed, the IETM Satellite meeting certainly acted as a step up in the search for common ground for future collaborations, with open-minded discussions already leading to concrete proposals. Though there might not be many solid structures found on this uncharted territory yet, Namsoo Kim was quite right to talk about the concept of a tent being a metaphor for the meeting. A tent is not only a place for gathering, a hospitable shelter, and a place to have a drink; it is also a lightweight, flexible, and mobile structure. Where will it move next? Joris Janssens is research coordinator at the Flanders Arts Institute, the supporting organization for the arts in Flanders, Belgium. In 2001, hebegan working at the Vlaams Theater Instituut(Flemish Theater Institute) as researcher, and by 2011 was a director. Jorisholds a PhD in Linguistics and Literature (Germanic Languages) from the University of Leuven. Between 1997 and 2001, he worked at the University of Leuven(Department Literatuurwetenschap, Netherlandic Studies). In 2001, he worked at the University of Viennain the Department for Nederlandistik. He has published and edited several books and articles on performing arts practice and policies, literary history, and pop culture.